Butterfly Milkweed is a perennial plant with a deep root system. Milkweed seeds have a tuft of long silky hairs attached to one end, which is the seed dispersal mechanism. A breeze can move the seeds quite a distance and kids find the "floating seeds" fascinating. During World War II, the silky hairs from the seed were used to stuff life jackets; many kids contributed to the war effort by harvesting the seeds. Native Americans boiled and ate the plant as greens. They also considered Butterfly Milkweed an important medicine; they chewed it and placed it on wounds and bruises and used it to induce vomiting. Butterfly milkweed was once considered a cure for pleurisy, an inflammation of the covering of the lungs. 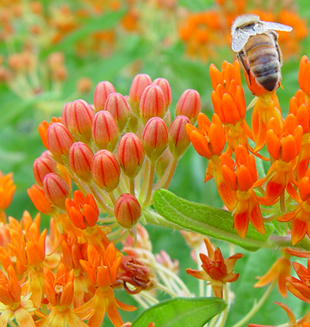 The common name of Butterfly Milkweed or Butterfly Weed refers to the plant"s popularity with butterflies. It is also called Pleurisy Root and Chigger Flower. The scientific name, Asclepias, is derived from the Greek god of medicine, Asklepios, while tuberosa refers to the swellings and knobs on the enlarged root system. Pollinators find the flowers of Butterfly Milkweed attractive. They attract a host of bee species including honeybees as well as butterflies, wasps, and hummingbirds. The leaves and other plant parts are consumed by a number of insect species, including most famously, the Monarch butterfly's caterpillar. Consuming milkweeds makes the insects poisonous to would-be predators, and the insects are often brightly colored, which serves as a visual warning to the predators. Milkweeds have a latex-like sap that contains a variety of chemicals, principally cardiac glycosides, which limit palatability and make the plant toxic when consumed in large quantities. While the sap of Butterfly Milkweed is not milky, the plants are bitter-tasting and livestock seem to avoid it. This is the showiest milkweed species; the striking flowers are usually orange but can vary from yellow to red. Many enamored landscapers have decided to transplant a Butterfly Milkweed only to discover that it has deep roots and is usually damaged during transplanting efforts; it is usually best to either establish it from seed or potted plants. It shares well with other species and is a great choice on drier sites. It works well as a cut flower and is a pretty in combination with Rattlesnake Master, Yellow Coneflower, and New Jersey Tea. This is a fun species to plant in outdoor classrooms or other kid-frequented settings due to the seeds that parachute through the air. Butterfly milkweed prefers sites on the drier end of the spectrum of soils. It is found in dry prairies, glades, savannas, open rocky woodlands and sand prairies. Palmer Amaranth: What's the Big Deal?